The QTransform class specifies 2D transformations of a coordinate system. A transformation specifies how to translate, scale, shear, rotate or project the coordinate system, and is typically used when rendering graphics. QTransform differs from QMatrix in that it is a true 3x3 matrix, allowing perpective transformations. QTransform's toAffine() method allows casting QTransform to QMatrix. If a perspective transformation has been specified on the matrix, then the conversion to an affine QMatrix will cause loss of data. A QTransform object can be built using the setMatrix(), scale(), rotate(), translate() and shear() functions. Alternatively, it can be built by applying basic matrix operations. The matrix can also be defined when constructed, and it can be reset to the identity matrix (the default) using the reset() function. 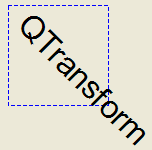 The QTransform class supports mapping of graphic primitives: A given point, line, polygon, region, or painter path can be mapped to the coordinate system defined by this matrix using the map() function. In case of a rectangle, its coordinates can be transformed using the mapRect() function. A rectangle can also be transformed into a polygon (mapped to the coordinate system defined by this matrix), using the mapToPolygon() function. QTransform provides the isIdentity() function which returns true if the matrix is the identity matrix, and the isInvertible() function which returns true if the matrix is non-singular (i.e. AB = BA = I). The inverted() function returns an inverted copy of this matrix if it is invertible (otherwise it returns the identity matrix). In addition, QTransform provides the det() function returning the matrix's determinant. Finally, the QTransform class supports matrix multiplication, and objects of the class can be streamed as well as compared. A QTransform object contains a 3 x 3 matrix. The dx and dy elements specify horizontal and vertical translation. The m11 and m22 elements specify horizontal and vertical scaling. And finally, the m21 and m12 elements specify horizontal and vertical shearing. All elements are set to zero except m11 and m22 (specifying the scale) and m13 which are set to 1. Constructs a matrix with the elements, h11, h12, h13, h21, h22, h23, h31, h32, h33. Constructs a matrix with the elements, h11, h12, h21, h22, dx and dy. Constructs a matrix that is a copy of the given matrix. Note that the m13, m23, and m33 elements are set to 0, 0, and 1 respectively. Returns the horizontal projection factor. Returns the vertical projection factor. See also dx(), translate(), and Basic Matrix Operations. See also dy(), translate(), and Basic Matrix Operations. Returns the adjoint of this matrix. See also m31(), translate(), and Basic Matrix Operations. Returns true if the matrix represent an affine transformation, otherwise returns false. Returns true if the matrix represents some kind of a rotating transformation, otherwise returns false. Returns true if the matrix represents a scaling transformation, otherwise returns false. Returns true if the matrix represents a translating transformation, otherwise returns false. Creates and returns a QPointF object that is a copy of the given point, p, mapped into the coordinate system defined by this matrix. Creates and returns a QLineF object that is a copy of the given line, l, mapped into the coordinate system defined by this matrix. Creates a transformation matrix, trans, that maps a four-sided polygon, one, to another four-sided polygon, two. Returns true if the transformation is possible; otherwise returns false. This is a convenience method combining quadToSquare() and squareToQuad() methods. It allows the input quad to be transformed into any other quad. See also squareToQuad() and quadToSquare(). Creates a transformation matrix, trans, that maps a four-sided polygon, quad, to a unit square. Returns true if the transformation is constructed or false if such a transformation does not exist. See also squareToQuad() and quadToQuad(). See also QTransform(), isIdentity(), and Basic Matrix Operations. Rotates the coordinate system counterclockwise by the given angle about the specified axis and returns a reference to the matrix. Note that if you apply a QTransform to a point defined in widget coordinates, the direction of the rotation will be clockwise because the y-axis points downwards. The angle is specified in degrees. The angle is specified in radians. Sets the matrix elements to the specified values, m11, m12, m13 m21, m22, m23 m31, m32 and m33. Note that this function replaces the previous values. QMatrix provides the translate(), rotate(), scale() and shear() convenience functions to manipulate the various matrix elements based on the currently defined coordinate system. Creates a transformation matrix, trans, that maps a unit square to a four-sided polygon, quad. Returns true if the transformation is constructed or false if such a transformation does not exist. 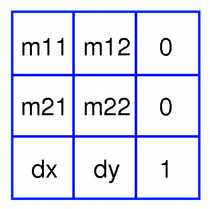 See also quadToSquare() and quadToQuad(). Returns the QTransform cast to a QMatrix. Returns the transformation type of this matrix. Returns the transform as a QVariant. Returns the result of performing an element-wise multiplication of this matrix with the given scalar. Returns the matrix obtained by adding the given scalar to each element of this matrix. Returns the matrix obtained by subtracting the given scalar from each element of this matrix. Returns the result of performing an element-wise division of this matrix by the given scalar.